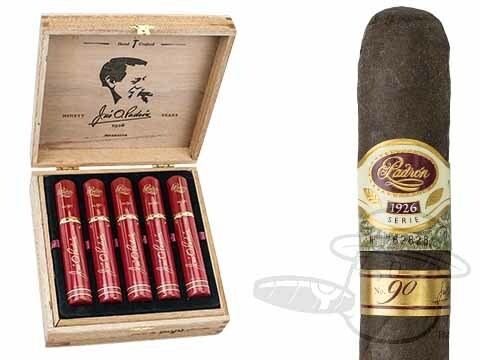 Specially crafted to commemorate third-generation Cuban cigarmaker Jose O. Padron's 75th Birthday, the Padron Anniversario Serie 1926 90th Maduro was blended to suit the Padron family patriarch’s well-honed palate. Full in body, and rich in complexity and balanced flavor, all the tobacco used in these limited edition cigars have been aged for 5 years in order to achieve maximum smoothness and a seamless delivery of its layered tasting notes. Unlike most Padron cigars, this special edition vitola is round, as opposed the the company’s traditional box-pressed construction. Presented in commemorative boxes of 10 cigars in gorgeous individual tubes bearing the signature of Senor Padron himself, Anniversario Serie 1926 90th Maduro is a must-have for any fan of the finest in Nicaraguan flavor. Well cafted. Smooth burning. Full of flavor and worth every cent. My go to cigar from here on in!! Draw starts out like a jumbo drink straw, tightens to perfection @ about 1/2" in. Tons of flavor - bread, light earth, chocolate, with a peppery tingle on the tip of the tongue/lips on the finish, never attacking the throat. Changes to a creamy chocolate/coffee with just a touch of strength at the end. My new favorite. Incredible cigar. Price is really high, so save these for a special occasion. This is one great smoke. I wish that I had 30 cases of the these puppies. The maduro wrapping makes it happen for me along with the ease of draw. Let me stop writing this review so that I can go have another smoke while watching the sunset. Padron Anniversario Serie 1926 90th Maduro Tubos is rated 4.9 out of 5 based on 6 customer ratings.